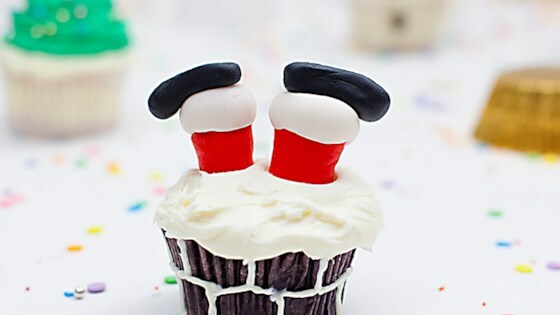 "Santa diving down the chimney is immortalized in these adorably decorated cupcakes. Perfect for a kid's Christmas party!" Spread a thick layer of white frosting onto each cupcake. Create a snow-like effect with a palette knife or the back of a spoon. Spoon the remaining frosting into a piping bag with a small round tip. Pipe rows of rectangles, offset from one another, onto the base of the cupcake to create 'bricks'. Shape red fondant into 24 small cylinders for Santa's legs. Shape the black fondant into 24 boots or shoes. Divide the white fondant into 24 balls and flatten into round circles. Glue the white fondant circles onto the bottom of each red leg with a bit of water. Affix a black boot to the bottom of each red leg, then use a spoon to create the soles. Use your fingers to slightly narrow the other end of each leg. Stick the narrow ends of two legs into each cupcake. Repeat with remaining legs and cupcakes. Watch how to decorate cupcakes with Santa hats, three different ways.